#1. Mark's last day at his current job ends today! We are so excited for him and I think a celebration is in order tonight! Change of paint color for the house! 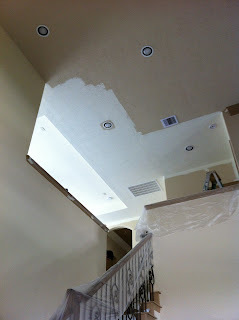 The fumes are fierce but it's going to be fabulous when they're done! Happy 3 day weekend to everyone! Congrats! We're so happy for Mark! And woo hoo to the paint! Can't wait to see it when it's all done! What 3 day weekend? We don't have a 3 day weekend?!? This is such exciting news!!!!! Happy 3 day weekend to you too :) Love a long weekend.